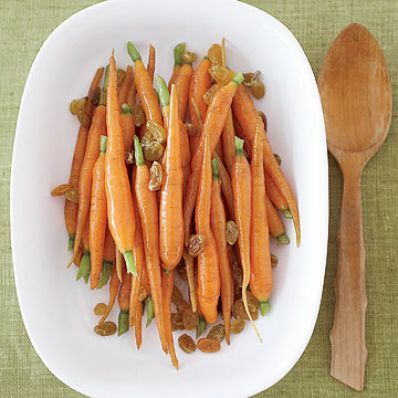 Ginger adds a pungent, spicy flavor to this yummy glazed carrot and golden raisin recipe that makes the perfect accompaniment to your favorite meat. 1 of 3 Melt butter in a large skillet over medium heat, tilting pan to coat completely. 2 of 3 Add carrots and cook for 1 minute. Add sugar and stir to combine; cook for 1 minute. 3 of 3 Add chicken broth, grated ginger, raisins, salt and pepper and cook for 20 minutes or until carrots are tender when pierced with a fork. Serve warm. Per Serving: 436 mg sodium, 2 g fiber, 5 g Fat, total, 9 mg chol., 2 g sat. fat, 107 kcal cal., 1 g pro., 17 g carb.